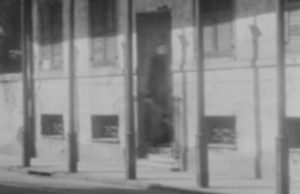 Some people claim this photo taken by a French photographer is actually an image of The Axeman entering the home of his last victim Mike Pepitone. When you think of New Orleans, a few things probably come to mind: fun things like Mardi Gras, the food, the drinks, or if you’re a football fan, the New Orleans Saints. Or perhaps you’re reminded of darker moments in the city’s history like Hurricane Katrina. One thing that probably should come to mind is the music, specifically, jazz. The history of jazz and the history of New Orleans are inextricably entwined. Jazz is part of the city’s life’s blood. Part of it’s very soul. On the night of March 19, 1919, all the city’s dance halls were filled to capacity, and everywhere amateur and professional musicians played in venues big and small, from smoky barrooms to people’s homes. Wealthy white patrons hired musicians straight out of the city’s red light district to come and play private concerts for them in their living rooms. Those without the financial means to hire live musicians cranked up scratchy phonograph records and wore their needles down playing them over and over again. That night jazz echoed through the midnight air and all the way until the first light of morning split the darkness. Now you might not think there was anything unusual about all this reverie–New Orleans is no stranger to big parties–but there was. On this particular night, the citizens of New Orleans weren’t playing jazz just for fun. On this night they were playing for their very lives. For you see, this city-wide concert they put on was meant for an audience of just one, an axe-wielding maniac who claimed to be a creature straight out of the foulest pits of hell. Coming to you from inside a ramshackle gin joint on the wrong side of the tracks, I’m Nate Hale, and this is The Conspirators. On May 22, 1918, a pair of brothers, Jake and Andrew Maggio were fast asleep in their room in an apartment they shared adjacent to the home of their other brother Joseph and his wife of fifteen years Catherine. Jake woke up first when he heard a noise coming from Joseph’s apartment that he thought sounded like groaning. Jake rapped on the wall but received no response. He shook Andrew awake, which was difficult because Andrew had gotten quite drunk earlier that evening celebrating his last night home before he was to be deployed to fight in World War I the next day. The two of them went outside and around to Joseph’s back door. They found that one of the lower panels on the door had been removed and placed on the ground nearby. A wooden chisel lay on top of it. They went into the house and down the hall to Joseph’s bedroom. They found their brother lying on the bed in a pool of blood, his feet dangling over the bedside and several huge gashes in his skull. Catherine’s lifeless body lay on top of Joseph. Joseph was still alive, and when he saw his brothers he tried to get up off the bed, but he slid to the floor and stared pleadingly at Jake and Andrew as he exhaled his last breath. Jake and Andrew called the police, who soon learned that Catherine had been killed by a deep slash across her throat that nearly decapitated her. Her face, like Joseph’s, had been severely damaged by what appeared to be the blade of an axe. Police searched the premises and in the bathroom discovered an axe in the cast iron bathtub, along with a pile of blood-soaked clothes. Whoever had wielded the axe had tried to wash it off, but traces of blood remained on it. The pile of bloody clothes led police to believe that the intruder had changed into clean clothes before leaving the scene. They also found a blood soaked straight razor in the bedroom that they believed had been used to slice Catherine’s throat. For a brief time, police suspected Joseph’s brother Andrew, since it turned out to be his razor, but lack of evidence, along with Jake’s alibi that Andrew had been with him blind drunk the night before made them look elsewhere. The timeline of events seemed to indicate that after entering the home through the missing door panel, the killer went to the bedroom and struck Joseph down first with a series of blows to the head with the axe. Afterwards, the killer used the axe on Catherine, before cutting her throat ear to ear with the razor blade. Police found money under Joseph’s pillow and Catherine’s jewelry box lay untouched, leaving them to believe robbery was not the motive. About a block away from the crime scene, police found a cryptic message written in childish handwriting with chalk on the sidewalk: “Mrs. Maggio will sit up tonight just like Mrs. Toney”. This message would lead police to speculate whether or not this crime may be related to a previous set of similar axe murders that occurred in Texas and Louisiana in 1911 and 1912. In total, 49 people had been brutally murdered in that series of attacks. The final victim of those attacks had been a man named Tony Schiambra. There was little evidence that tied the attack on the Maggios with the earlier string of murders aside from the use of the axe and the loose connection from the name Tony. But, in one instance, the earlier killer did also leave his own cryptic note behind near one of his victims: “When He maketh the inquisition for blood, He forgetteth not the cry of the humble, human five.” Police feared this could be the start of another series of murders. It wouldn’t be long before they discovered they were right. A month later on June 28, a bread delivery man named John Zanca was making his regular 7:00 am stop at a grocery store run by a Polish immigrant named Louis Besumer. Zanca was concerned when he found the store’s front door locked, since it had always been open at that time he came. He went around to the back door and he got the shock of a lifetime when Louis himself came to the door drenched in blood. Louis told police that he and his mistress Anna Lowe had been assaulted by an axe-wielding intruder sometime between 2 and 3 AM the night before. Louis suffered a skull fracture after the intruder bashed him in the skull with what turned out to be Louis’s own axe. The intruder then slashed Anna Lowe over her left ear, leaving her in a bloody heap on the floor. She was still alive but unconscious. Anna Lowe awoke while being rushed to the hospital, and at first she blamed a mulatto store employee for the attacks. But later changed her story to an even more bizarre admission that it had really been her lover Louis Besumer, and that he was actually a German spy. This caused a great deal of attention in the press, not just for the spy angle and viciousness of the crime, but also because of the scandalous affair that was revealed in the attack. A media firestorm ensued, with local newspapers reporting stories that police found secret spy documents in Besumer’s home and that opiates were found in the bedroom. Neither of these things were true. Besumer was tried in court, but was acquitted for lack of evidence of any wrongdoing. Anna Lowe died on August 5 from complications involved during plastic surgery in an attempt to repair the damage to her face caused by the intruder. Coincidentally, another attack occurred on the very same day Anna Lowe died. On that day, a man named Edward Schneider returned to his home on Elmira Street after a long day of work. It was unusually quiet in the house. He went into the bedroom and found his pregnant wife bloody and unconscious, her scalp split open and several of her teeth knocked out. When she awoke two days later in the hospital, Mrs. Schneider claimed she had little memory of the attack other than she had been attacked by a dark figure with an axe who resembled some sort of “phantom”. Despite the trauma of the attack, Mrs. Schneider gave birth to a healthy baby daughter a week later. Police arrested a man named James Gleason who had run from them, but they had to let him go due to lack of evidence. By now, officers had begun to believe this attack was related to the two previous attacks on the Maggios and Louis Besumer and his mistress. The pattern became clear just five days later when another attack occurred. On August 10, sisters Pauline and Mary Bruno were awakened in the middle of the night by eerie banging and thumping noises coming from their uncle’s nearby bedroom. When the sisters went into the hallway to investigate, they were startled when they were confronted by a shadowy heavyset figure in a suit and hat, who bolted when Pauline screamed. They found their uncle in his room covered in blood with several large gashes in his face. Although he was alive when he was rushed to the hospital, he died two days later. As in the attack on the Maggios, the killer had gained entry to the home by chiseling out a panel in the back door and left a bloody axe behind at the scene. In this case, as before, there were no signs that anything had been stolen, although the uncle’s room had been ransacked. By now the newspapers had begun to refer to the mysterious intruder as The Axeman and it was clear the public was beginning to panic. People began barricading themselves in their houses at night. Many people began sleeping in shifts so that there was always someone awake and watching out for the Axeman at all times. A few people reported finding chisel marks on their doors. One man, upon hearing what he thought was someone chiseling away at his back door, fired a shotgun blast through the door. When he finally worked up the courage to open the door, no one was there, but he claimed he found a chisel lying there and several fresh gouge marks in the wood. Numerous people claimed they found axes lying around their property, or saw mysterious cloaked figures in their yards. Most of these anecdotes can probably be chalked up to mass hysteria. The police were at a loss for answers. The killer left behind no fingerprints, and there was no clear connection between the victims. A retired police detective named John Dantonio speculated that the Axeman could be the same perpetrator behind the aforementioned 1911 attacks. He drafted what would today be called a psychological profile of the killer, believing that the individual responsible for the attacks might have a split personality, with an uncontrollable urge to kill, comparing him to the legendary serial killer Jack the Ripper. Months passed with no new attacks, and for a time it seemed like the public’s collective fears might fade. Until the night of March 10, 1919, that is. In an immigrant suburb called Gretna just east and across the river from New Orleans, a 68-year-old resident named Jordano heard screams coming from his neighbor’s home. He rushed next door to discover a horrific scene. A woman named Rosie Cortimiglia was cradling her dead two-year-old daughter in her arms. Lying next to them, in a pool of blood, was the unconscious body of her husband Charles. Charles, a local grocer, stumbled across a large man in dark clothing in their home and tried to fight him off, but was soon overcome by multiple blows to the skull. Mrs. Cortimiglia rushed out to see what was going on with her two-year-old daughter Mary in her arms, when the intruder turned on them. Despite the mother’s cries for mercy, the killer hacked the little girl to death, then bashed the mother mercilessly in the face, fracturing her skull. Police searched and soon found the trademark bloody axe as well as the chiseled out back door. Once again, no money or other valuables were stolen. Remarkably, Rosie Cortimiglia later claimed that the killers were none other than Jordano, the man who had come to help her, and his teenaged son Frank. Charles Cortimiglia vehemently denied these accusations. And despite Jordano being severely overweight and in far too poor of a physical condition to have crawled through the opening in the door, both men were tried for the crime and convicted, with Frank receiving a death sentence and Jordano receving life with no parole. Later though, Mrs. Cortimiglia would retract her testimony, revealing that she had lied in order to remove the men as business competitors of her husband. They were released in 1920. They have never caught me and they never will. They have never seen me, for I am invisible, even as the ether that surrounds your earth. I am not a human being, but a spirit and a fell demon from the hottest hell. I am what you Orleanians and your foolish police call the Axeman. When I see fit, I shall come again and claim other victims. I alone know who they shall be. I shall leave no clue except my bloody axe, besmeared with the blood and brains of him whom I have sent below to keep me company. If you wish you may tell the police not to rile me. Of course I am a reasonable spirit. I take no offense at the way they have conducted their investigation in the past. In fact, they have been so utterly stupid as to amuse not only me but His Satanic Majesty, Francis Josef, etc. But tell them to beware. Let them not try to discover what I am, for it were better that they were never born than to incur the wrath of the Axeman. I don’t think there is any need of such a warning, for I feel sure the police will always dodge me, as they have in the past. They are wise and know how to keep away from all harm. Undoubtedly, you Orleanians think of me as a most horrible murderer, which I am, but I could be much worse if I wanted to. If I wished, I could pay a visit to your city every night. At will I could slay thousands of your best citizens, for I am in close relationship to the Angel of Death. I am very fond of jazz music, and I swear by all the devils in the nether regions that every person shall be spared in whose home a jazz band is in full swing at the time I have mentioned. If everyone has a jazz band going, well, then, so much the better for you people. One thing is certain and that is that some of those people who do not jazz it on Tuesday night (if there be any) will get the axe. Well, as I am cold and crave the warmth of my native Tartarus, and as it is about time that I leave your earthly home, I will cease my discourse. Hoping that thou wilt publish this, and that it may go well with thee, I have been, am and will be the worst spirit that ever existed either in fact or realm of fantasy. That night the city was alive with jazz as it pounded out of every home, club and restaurant. Many of them played a new composition by a well-known composer of the time named Joseph Davilla called “The Mysterious Axeman’s Jazz”. Whether the killer was being true to his word, or whether the letter to the paper was a hoax, we’ll never know. But no one died that night. The killer did go on to claim four more victims that year, the last of which was a man named Mike Pepitone. In December 1920, a year after Mr. Pepitone’s death, police arrested the man’s widow in Los Angeles after shooting and killing a man named Joseph Mumfre, whom Mrs. Pepitone swore was the Axeman. Reports say that Joseph Mumfre may actually have been a man named Frank “Doc” Monfre, a pharmacist by trade, although some investigators believe he had been leading a double life as an enforcer for the burgeoning Italian Mafia in New Orleans. In fact some people now believe the string of murders were really part of an ongoing gang war since so many of the victims were grocers, and grocery stores and other shopkeepers were being used at the time as fronts for extortion rackets and illegal gambling. We’ll never know for sure if Monfre was the Axeman, but modern investigators have pointed out several gaps between murders that occurred while Monfre was in jail, and that no more axe murders occurred after he died. The Conspirators is written and produced by me, Nate Hale, an entirely fictional identity. If you like the show and want to help it grow, tell your friends and family about it, and leave me a review on iTunes. Thanks for listening.